For most of the summer I wore my Gravitymaster G-SHOCK the GPW-2000 — and it’s a great watch. However, as the weather cooled and I got back into the swing of wearing something more substantial than shorts and a T-shirt it became clear the the GPW-2000 was simply not going to work. It was too big. However, I really like the G-SHOCK line so I looked for a new watch, which lead me to the hard to find GSTS-130C. I’ve now been wearing that watch for a few weeks, so it’s time to talk about it. This is part of the G-STEEL collection, which means that it has a shiny metal bezel instead of resin. It is also a more street wear type of watch than the usual rugged oversized G-SHOCKS. It is, however, still pretty big. It has a bunch of the other standard G-SHOCK stuff too (stopwatch, timer, alarms, world time) but that’s all rather boring. What it doesn’t have is any time sync, just your standard Casio quartz watch. So why this watch, when I’ve been in love with the time sync features on the Gravitymaster? Because it is way smaller, and the accuracy difference is not noticeable at all to me. With this, I get most of what the Gravitymaster offers, in a smaller package that looks more subtle and overall better looking. 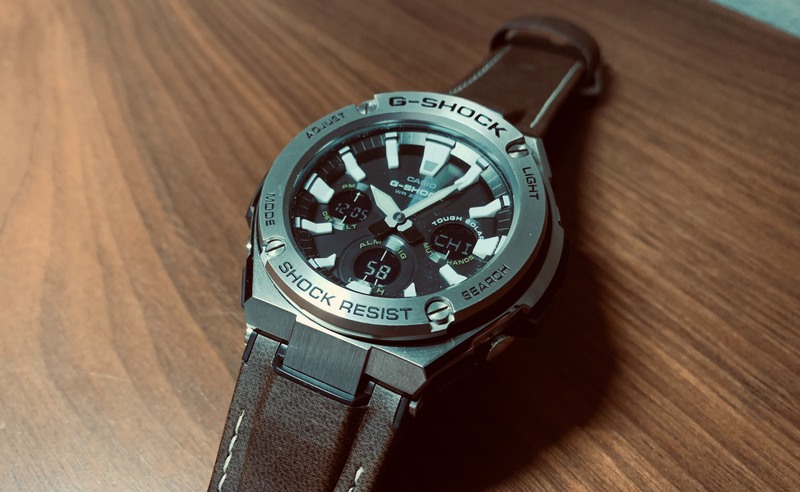 One of the features of the G-STEEL lineup is that they offer some unique bands: leather and nylon. This watch comes with a Nylon black band, but it’s more than that. Because it is Cordura on the outside (feels rough like 1000D GORUCK), resin in the middle, and “tough” leather on the inside of the band. The issue is that this band is terrible. The nylon face material is so rough feeling that it reaches out and grabs every piece of lint it can find. It also hangs up on my clothing, almost like Velcro. Overall, this band is just not great. Sure, it’s comfortable enough, but it’s not ideal. 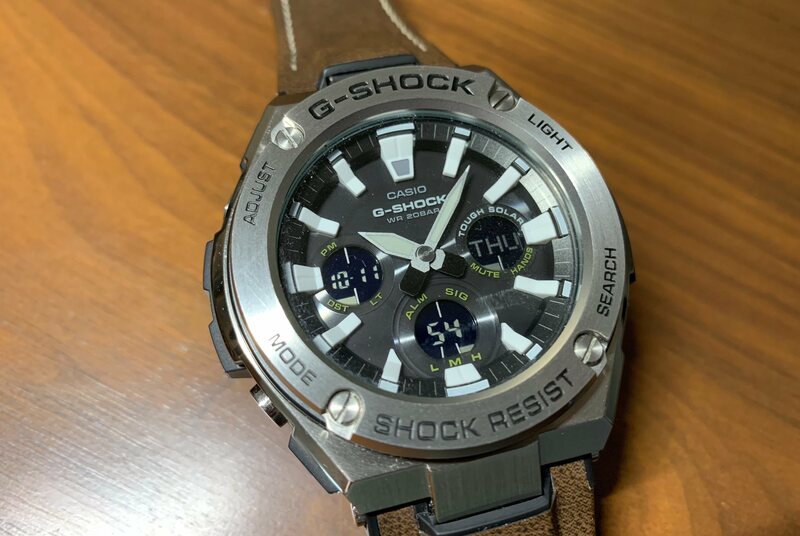 Luckily you can source some of the other bands Casio offers for this lineup from repair parts resellers, and I picked up a dark brown “tough” leather band from another variant of this watch. This band is fantastic — perhaps one of the best bands I’ve owned. It’s wrapped in some formulation of what is synthetic leather which Casio calls “tough” leather. And it has a resin core. The result is something which doesn’t stretch out like a leather band, but feels like leather. 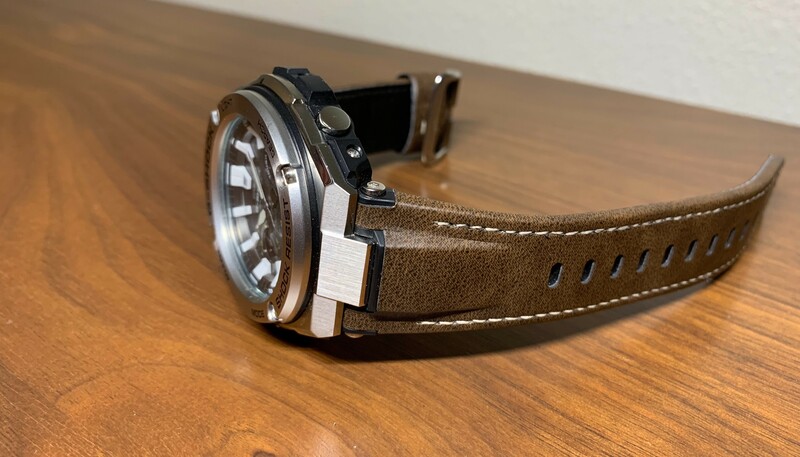 Again, it’s fantastic, and the only option for bands you should be looking at are the tough leather options with the G-STEEL lineup. All of the functions on this watch work as described, so I’d rather focus on two functions: time telling and power. When writing about the Gravitymaster I talked about the perfect watch being one you never have to touch. The Gravitymaster achieved this with three ways to keep itself perfectly accurate, as well as tough solar power. The GSTS-130 doesn’t have any methods of auto-time setting (though there are similar models which do) and instead just has a quartz movement which is roughly +/-15 seconds per month. It does, however, have tough solar. So like the Gravitymaster, you never have to worry about powering this watch. Generally speaking, light around you will keep it perfectly charged and mitigate any concerns on that front. So let’s talk about the time keeping. It’s accurate enough. I personally have not noticed it not being accurate in the weeks I’ve owned it, but I don’t doubt it is slipping at some imperceptible value of time. Either way, it doesn’t matter because it’s as accurate as I would ever need. That’s not to say multi-band 6, GPS, or Bluetooth are not excellent options, but it is to say that like with most decent quartz movements, they are simply good enough for almost everyone. This is too. I think I was drawn to the notion of always having incredibly accurate time on my wrist, over the fact that there’s no need for that level of accuracy in my life. I am sure there is for some, but not for me. I mentioned above, one of the features is a dual illuminator with neon output — truthfully it didn’t mean much to me when I bought the watch. But, I think it is one of the best features of the watch. 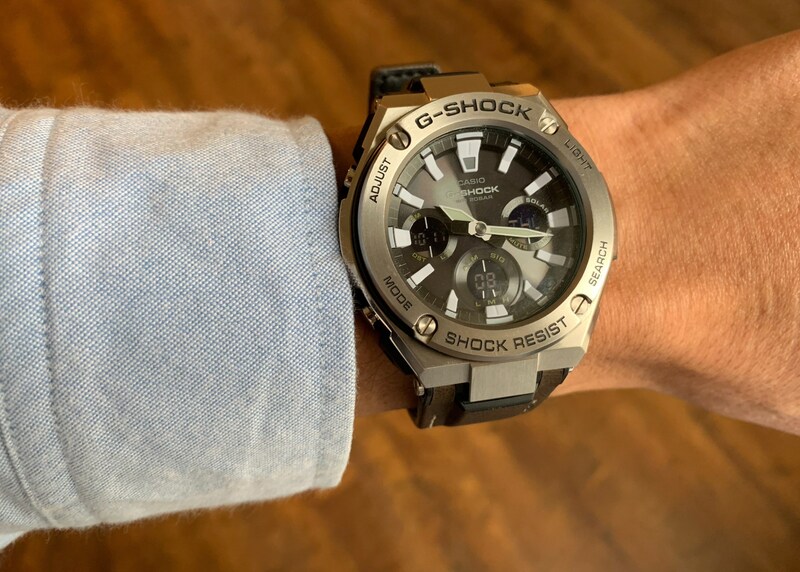 Most G-SHOCKs feature a very bright white light to light up the face — this achieves readability, but is often far too bright. The GSTS-130 takes a much more subtle approach. The first light is actually a backlight for the three small LCD displays on the face. The second light is the neon light, and it comes out of the bottom 6 position index. This looks basically like a black light. It doesn’t illuminate the lume painted on the hands, but rather all indices and the tips of the hands. All in all it is very subtle, never too bright, and usually very legible. It’s fantastic and something I hope to see Casio use more. I was worried about this dial because it does have three digital displays. The first shows time or date, the second the day of the week or the mode, and the third tracks seconds. Because I opted for the variant with the negative displays (black background, light read out) they blend right in and are not immediately noticeable — at the expense of overall legibility in any non-sunlight conditions. The biggest thing to note about this watch is the lack of a moving second hand, instead it is being tracked in the sub-dials. At first I hated this, but it’s come to not bug me. In fact, the digital displays make this watch far easier to use than the Gravitymaster which often was slow to move through modes, and complex to see what was what. Here you can quickly setting timers, start a stopwatch, or move between time zones without waiting for analog dials to spin around. It’s overall functionally better. I am very torn about this watch. It is in no way bad. But I am not sure it is great. I would say overall there’s nothing I don’t like about this watch, some things I really like (strap and the illuminator), but nothing which tips the balance. Which might make it a really good tool watch, because I will have no problem letting this watch see abuse from working around the house or on cars. While at the same time, I’ll have no problem wearing this watch most places. Add in the lower cost, and it’s a great watch. Unfortunately, this configuration is very hard to find. Which is why I would recommend the GSTS-130L, which is has the better leather band, but positive digital displays (even that variant can be hard to find). To that end, I know this isn’t likely to see much more wrist time from me — so if you are interested in snagging this from me shoot me an email — I’ll include both bands for it. It basically is a watch with a blacklight so that you can relive when you discovered black lights all over again. Also, it’s solid.